There are examples of cave churches in many places in southern Italy: in Matera, for example, the entire town, churches and all, was cut into the sides of cliffs; or in Fasano, near Brindisi (again, the church was part of an entire cave village). In the territory of Mottola in Puglia, there are about 30 such cave churches, dug according to a precise liturgical scheme that has the apse (the semicircular projection of the church with a domed or vaulted roof) facing east. Almost all of these are termed "Byzantine" (also Italo-Greek) churches because they were built by adherents of the Greek Orthodox faith who migrated into Italy at about the time of the so-called "iconoclast" controversies (the eighth and centuries). 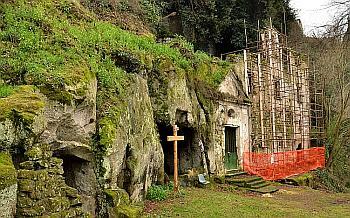 Also well-known is the picturesque church of Sotterra di Paola sotterra means, indeed, 'underground') in Calabria. And perhaps the most spectacular example of an underground sanctuary in Italy is the sanctuary of the archangel Michael on the Gargano peninsula in the town of Monte Sant'Angelo. In Naples there are a few examples that come to mind in the same general category of underground worship (some of it pre- or non-Christian): the Fontanelle cemetery is noted above (it qualified as a place of worship once such things as altars and other accoutrements of worship were installed on the premises); then, consider the original Greek hypogea (tombs) in what is now the Sanità part of the city, or the Grotto of Mithra beneath the Pizzofalcone hill. Also, in Marano, there is the subject of this entry, the small church of Santa Maria di Pietraspaccata (all images). An ideal place to dig a hole in a tufa mountain in Naples would be on the northwest slope behind the great Camaldoli hill, itself a remnant wall of the great archiflegrean caldera collapse eons ago. That is where we find the town of Marano and the cave church of Santa Maria di Pietraspaccata (split stone) built on and in the hill in woods that slope down towards the town of Quarto. The church is in a state of total decay and those concerned with preserving the cultural artifacts of the area have launched an appeal to save it. I don't see that as impossible; I do see it as difficult, however. The history of the church is obscure, at least as to the original use of the site for religious purposes. A Christian church, a hermitage, goes back at least to the 1600s, but the man-made cave, itself, shows some evidence of being much older than that and may have been a cult site or even a cemetery in the days of ancient Rome. Interestingly, though the church is in terrible condition, there are still religious rites, including baptisms and communion, held on the site; the figure of Our Lady of Pietraspaccata is still revered by locals, who have managed to keep at least part of the premises in working order. One of the legends connected with the site is that of the massive rock that split from the cliff side during the construction of the original hermitage; it splintered and changed in mid-flight into a likeness of the Madonna, which was then displayed as the iconic religious relic of the church. It was stolen in the 1970s, according to one source. The structure that will have to be restored includes the stairway entrance and facade in the rock face, three separate inside levels around the main chapel, and, as long as we are making a wish list, the murals on the wall and the majolica tiles in various places. There is also a belfry in shambles. I don't imagine there is any hope of getting the Madonna back. all photos courtesy of Napoli Underground (NUg).